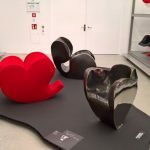 While all Swiss furniture manufacturers are friendly, one particularly friendly Swiss furniture manufacturer springs to mind whenever the discussion turns to furniture design as being more than the shape of a chair, furniture design as a cultural imperative or the preservation of furniture design heritage. 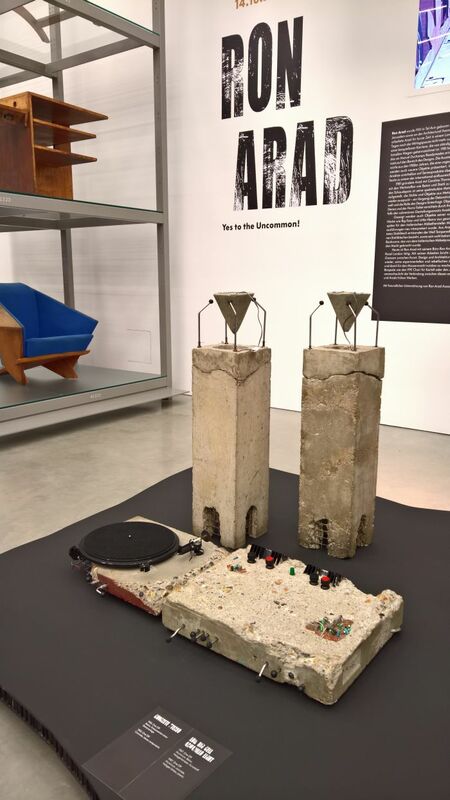 As if confirmation were needed, the Sticks & Stones crusher greets visitors to the Vitra Design Museum Schaudepot exhibition Ron Arad: Yes to the Uncommon! Born in Tel Aviv in 1951 as the son of a painter and photographer, Ron Arad initially studied at the Bezalel Academy of Arts and Design in Jerusalem before moving to London in 1974 and the Architectural Association where his tutors included the likes of Peter Cook and Bernard Tschumi. Despite, or arguably because of, his architecture training, and for all the freedom in his definition of the term “architecture” he’d developed at the Architectural Association, Ron Arad has always worked across a range of creative disciplines including products design, graphic design, interior design, art in a purer sense, and of course furniture design. 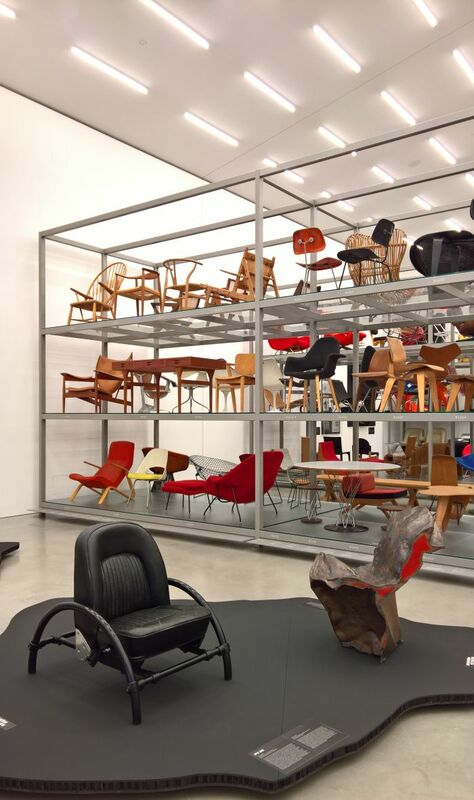 Ron Arad’s first forays into furniture were objects created from the Kee Klamp scaffolding system, appropriating the flexibility offered by the system’s wide range of connection joints to create objects across furniture genres, before making his popular breakthrough in 1981 with the Rover Chair: an object which pairs salvaged seats from scrapped Rover 2000 cars with bent scaffold tubing and Kee Klamp joints to create a domestic armchair. And an object which despite the industrial decay implied by its components is a very refined, courteous piece of design, and one formally very reminiscent of Alvar Aalto’s Paimio armchair, the Southampton Chair by Warren McArthur or a couple of works by Jean Prouvé. In its material, construction and symbolism it is however very much its own work. Presenting some 18 projects backed up by videos, photographs, texts and archive material, Yes to the Uncommon! essentially tells the story of What Ron Arad Did After Rover. An abridged story of What Ron Arad Did After Rover, a concise exploration of Ron Arad, his methods and his work throughout the 1980s, 1990s and 2000s, as reflected by those projects held by the Vitra Design Museum collection including, and amongst many others, his London Papardelle, Big Easy and Tom Vac chairs or the singular Concrete Stereo. In 1979 Ron Arad established the company One Off together with Dennis Groves as a vehicle for producing and distributing his design, before assuming sole control of it in 1981. The name One Off being not only programmatic for the focus of the business in its early years, creating as it did largely customised objects, but also neatly describing the uniqueness of the pieces, each of which was hand hewn with all the variety that produces, and meaning the rawness of the One Off objects is not just a result of material or construction but originates much more in the intrinsic nature of the objects and the understanding of design from which they arose. Something neatly demonstrated in the course of Yes to the Uncommon!, especially in a work such as the Tinker Chair whose rough hammered finish Arad customised, i.e individually hammered, to fit the customer. Industry did however catch up with Ron Arad and over the decades he has realised more commercial, certainly more uniform, smoother, precise objects for and with manufacturers as varied as Driade, Fiam, Moroso, Magis, Vitra or Kartell: and more often than not objects which began life as battered industrial objects before being refined for the industrial mass market. Amongst its other functions, Yes to the Uncommon! assists in explaining the apparent juxtapose, when not direct conflict, between the rough and smooth sides of Arad’s canon. 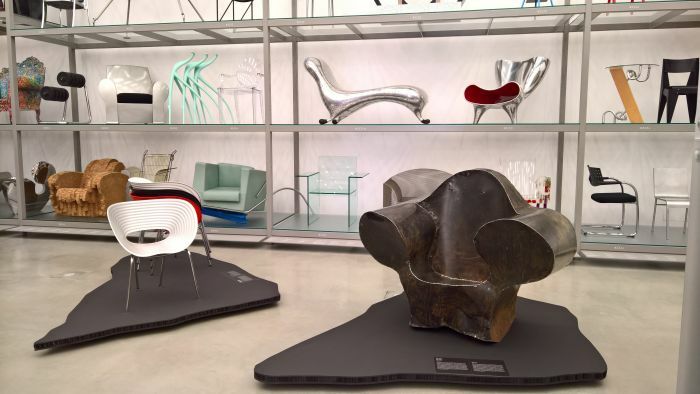 In addition to being an exploration of Ron Arad’s furniture design work Yes to the Uncommon! 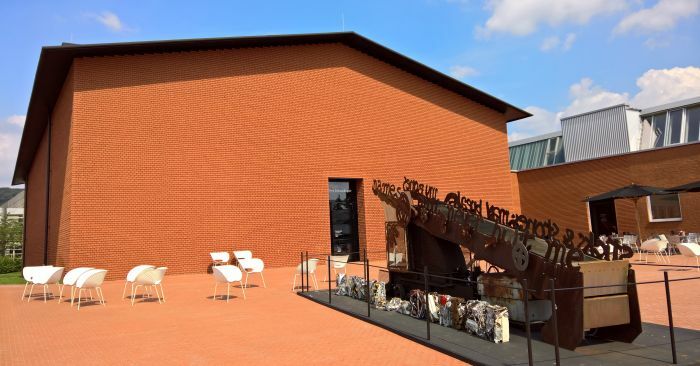 is also an exploration of Arad’s cooperations with Vitra, whereby, the focus is pleasingly on Arad, not Vitra. The relationship between Vitra and Ron Arad pre-dates the above noted Sticks & Stones rescue action, and begins when then Vitra Chairman Rolf Fehlbaum saw works by Ron Arad in an exhibition staged during Milan Furniture Fair 1985, and subsequently invited him to design an object for the Vitra Edition Collection, a collection of experimental objects created by invited designers in conjunction with Vitra, and more for the experimentation than any commercial intention. 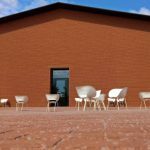 The result of Arad’s cooperation was the Well Tempered Chair, crafted from rolled tempered steel sheets and sturdy bolts to create an object almost inseparable from a classic lounge chair. Yet galaxies removed. 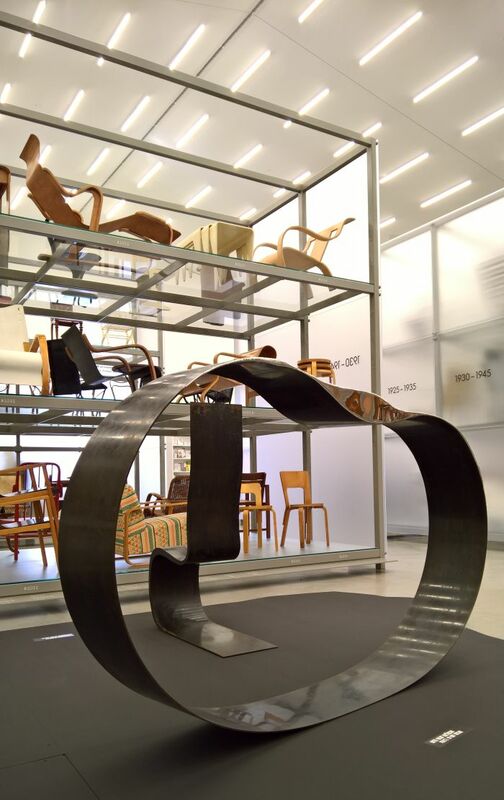 Ron Arad and Vitra continued their explorations of tempered steel sheet in 1990 in context of a workshop in Weil am Rhein, a workshop which led directly to works such as the so-called Bucking Bronco, a steel hoop on which one can sit and bounce, and which indirectly, through Arad’s subsequent experimentation, resulted in his Bookworm bookshelf, an object which in the plastic version from Kartell arguably counts as that product with which Ron Arad is most popularly associated. 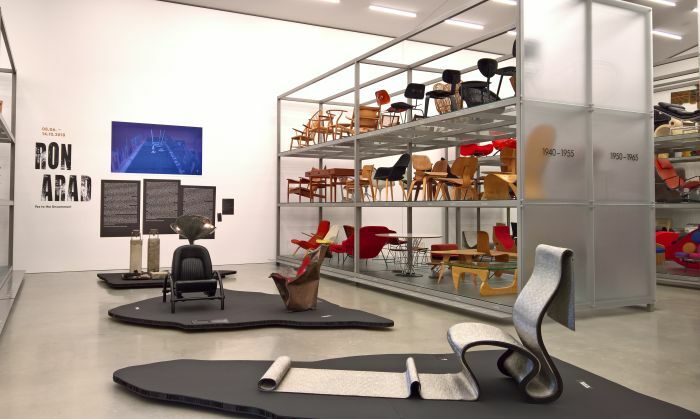 Arad’s most popularly recognised cooperation with Vitra is equally arguably the 1997 Tom Vac Chair, a project which, and somewhat ironically, didn’t begin directly with a cooperation with Vitra, nor the use of tempered steel sheets, but rather began as an aluminium sheet chair realised for an installation commissioned by the Italian design magazine Domus. 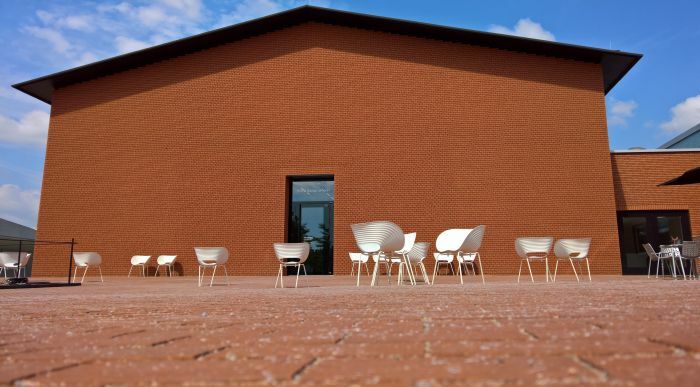 Vitra subsequently taking on the project and today produce the Tom Vac in the familiar injection-moulded polypropylene version. And the only Ron Arad project Vitra currently have in production. A state of affairs which, when considered in context of the length of their relationship, does tend to lead you to pose the question, why? Why not more commercial cooperations? There’s no reason why there should be. No compulsion on either side to up the number of commercial products. And in a way it is pleasing that they don’t, pleasing that the focus is and has been, theory, experimentation and exploring boundaries. That said we know what we want to see at Orgatec this October. And that we’ll be heartbroken if we don’t. Yes to the Uncommon! 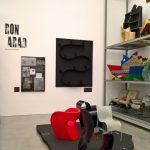 helps provide a more honest view of Ron Arad, and for all of a designer primarily interested in materials, of exploring new understandings of the natural, inherent, properties of materials, and thereby working with a material rather than using a material. And yes we could have written “steel” rather than “material”, for it is a recurring theme in the exhibition. But not the exclusive one, aluminium, concrete, textiles and polyurethane foam also get a look in. Primarily interested in materials. And volumes. Yes to the Uncommon! 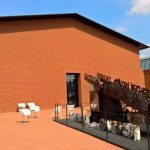 elucidating as it does a creative who gives a tangibility to an otherwise ethereal piece of space, makes the immaterial physical with the singular aim of making it functional. 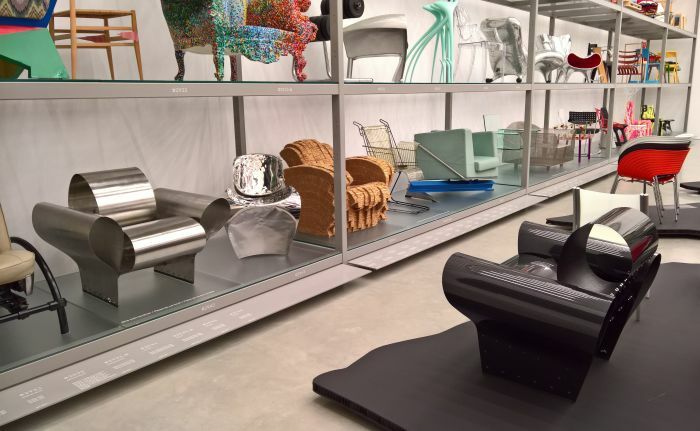 Claiming Ron Arad forms space into objects may be stretching our credibility a little too far, but in many regards that is exactly what he does. 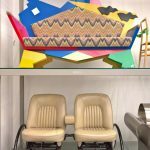 Particularly rewarding in context of understanding Arad’s work is the opportunity the presentation in the Schaudepot allows to consider Arad’s work in context of the wider (hi)story of furniture design, in all those objects that surround you. Do that, which we’d strongly recommend, and you’ll quickly discover that for all his individuality and idiosyncrasy, Ron Arad shares a lot of formal, construction, philosophical and functional traits with that (hi)story: his aforementioned Bucking Bronco, for example, relying on principles akin to those required for the moulded plywood works by the likes Marcel Breuer, Gerald Summers, Alvar Aalto et al which neighbour it. Viewing Yes to the Uncommon! 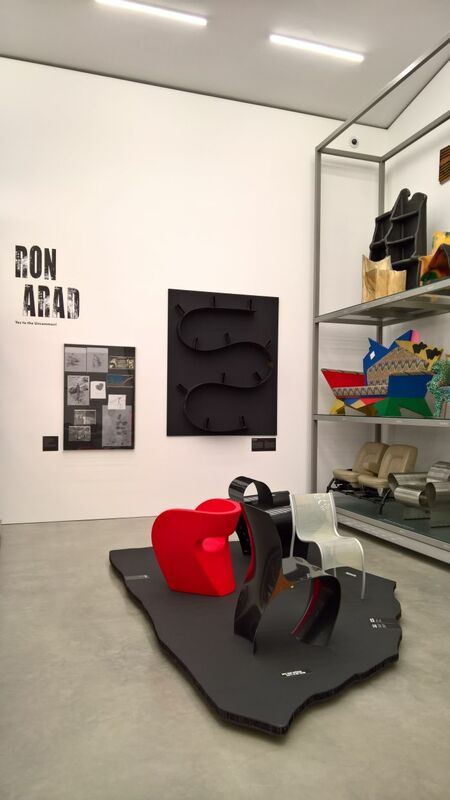 one understands that in many regard what Ron Arad does isn’t particularly new: Jean Prouvé, for example, was working with the intrinsic properties of steel sheet in the 1930 and 1940s; Achille & Pier Giacomo Castiglioni did ready-mades and salvaged in the 1950s and 1960s; Abitacolo habitable, Bruno Munari’s contribution to the 1972 MoMA New York exhibition Italy. The New Domestic Landscape was a domestic environment based on a scaffolding morphology. 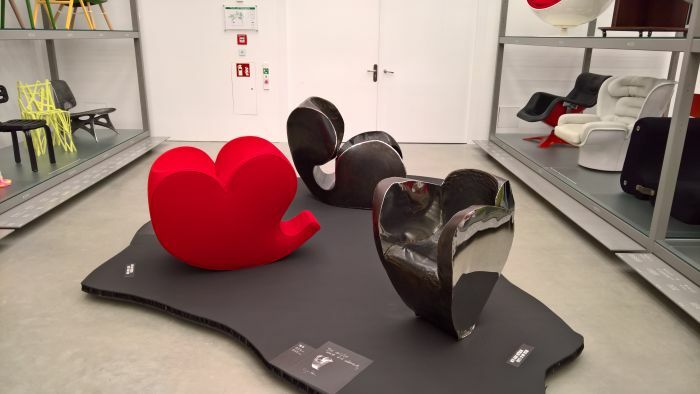 Ron Arad however imbues his work, or at least the better pieces, with a subtly, a depth and a contradiction that allow them to exist on a level that is all their own yet accessible to all. What may resemble a quickly hobbled together and then soundly beaten collection of metal, is much more an exploration of materials, space, process; and is a deliberate, considered deception which encourages thought and consideration on the nature of the object before you and by extrapolation all objects. 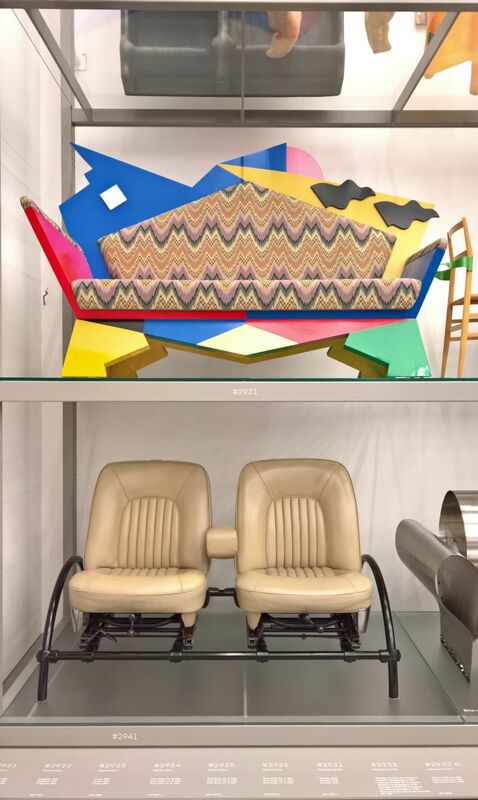 Juxtapositions that are statements as much as they are furniture objects. Yet are always in the first instance furniture objects. Apart from Sticks & Stones. At Nouvelles Tendances visitors were encouraged to bring along chairs which were fed into the machine which, much like a car crusher, reduced them to tangled rectangles. Arad’s plan was to construct a wall from the rectangles. 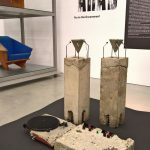 Before the Vitra Design Museum Schaudepot Sticks & Stones stands sadly silent, health and safety regulations being somewhat stricter now than they were in Paris 1987. Although, given the amount of food it would find in the Schaudepot, probably for the better. And in any case, the mental digestion of Ron Arad’s work is much more satisfying, nourishing, fulfilling, moreish, and certainly more recommendable.